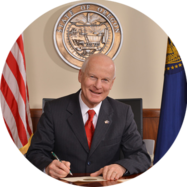 SALEM, OR — Today, Oregon Secretary of State Dennis Richardson announced that fifth graders from across the state elected Dom Peters of Gervais as the 2018 Oregon’s Kid Governor (ORKG). The announcement came during a school assembly at Willamette Valley Christian School where Dom is a fifth-grade student. Schoolmates cheered as Kid Governor-elect Dom, who ran on an anti-bullying platform, thanked voters and fellow students for their help and support. Watch Dom’s campaign video on Youtube and today’s announcement on Oregon’s Kid Governor Facebook page. This national program, which is in its first year in Oregon, was started by the Secretary of State’s office in order to teach students about elections and the importance of civic engagement and contributing to their communities. The program is open to all Oregon fifth graders. Nominations were received from public, private, home, and charter schools from across the state. Candidates were required to submit a campaign video about a community issue important to them as well as a three-point plan designed to help other students take action on the issue. Eight final candidates moved forward to the week-long general election, and their videos were posted to or.kidgovernor.org for voters to watch before casting their ballots. Dom will begin his one-year term on January 9, 2018 after his inauguration ceremony at the State Capitol. As Kid Governor, Dom will work to raise awareness for the need to prevent bullying and encourage students from across Oregon to do the same. He will also encourage civics awareness among Oregon’s fifth graders. To learn more about the program and to view the final candidates’ videos, go to or.kidgovernor.org. You can also follow Oregon’s Kid Governor on Facebook.